The US Army initiated the Advanced Attack Helicopter program in 1972 after cancellation of the previous replacement for AH-1 Cobra, the Lockheed AH-56 Cheyenne. The Hughes YAH-64 was selected for production out of that competition and the Apache has served since 1986. In order to increase the Apache's lethality and survivability, an upgrade program was developed to integrate the APG-78 Longbow millimeter-wave radar on the aircraft to allow the Apache to engage multiple targets with the radar-guided Hellfire missile without breaking cover. Despite its advanced capabilities, the Longbow Apache was not able to employ its lethality until it could be equipped with the combat identification system that would prevent it from inadvertently engaging friendly forces. With the introduction of the Block II upgrades, the AH-64D was equipped with the needed tools for integrated battlefield operations. AH-64D Block III (redesignated as AH-64E) added more powerful engines, new rotorblades, the JTIDS datalink, and other upgrades to keep this aircraft highly effective into the future. 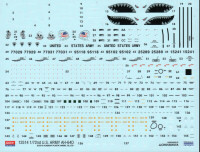 Academy produced the 1/72 AH-64A Apache kit which is considered by many to be one of the best kits of the subject available. 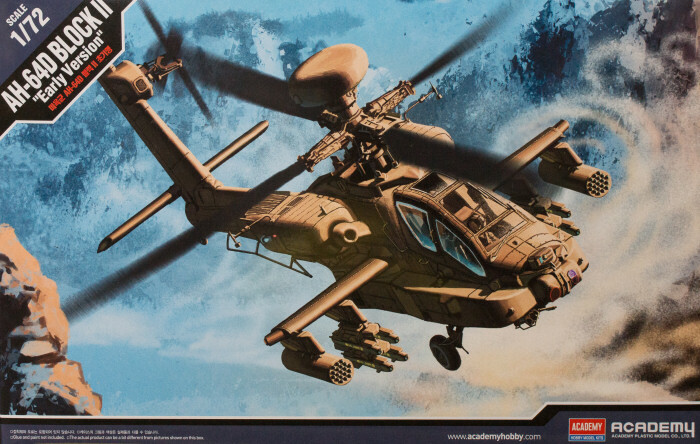 Academy has now released their 1/72 AH-64D Apache Block II kit and you'll see in the parts images that this isn't the AH-64A kit with a Longbow radome. They've done their homework with this kit. If you're modeling an AH-64D as part of OEF or as part of the peace-keeping forces in OIF, check your references as many of these Apaches did not have their Longbow radomes installed once the armor threat was gone. This is another nice release from Academy to enhance your scale flightline. My sincere thanks to MRC for this sample!